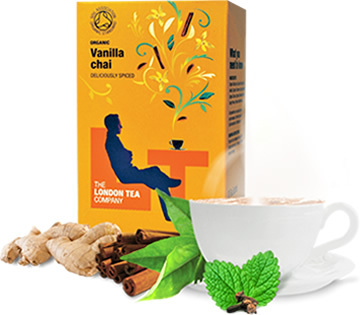 I’m currently enjoying a cup of Vanilla Chai from The London Tea Company. It comes in pyramid bags, and it says, “Gourmet * Organic * Ethical” on the box (although they don’t provide any further information on that, or if they do, it must be very well hidden). It’s rather intense – even with a lot of soymilk you still get a strong taste of ginger and vanilla (pieces of which you can see inside the pretty mesh pyramids – which I am told are actually made from cornstarch, so they are biodegradable). I personally prefer their herbal infusions (especially the Strawberry Mint one), but a cup of this vanilla chai is very welcome on a coldish autumn evening. I love the sound of this chai! I am also disproportionately fond of pretty pyramid tea bags.